SAN FRANCISCO, Calif.—There were two problems with my trip to the Bay Area. The first was that I didn’t have Giants tickets. A lifelong east coast resident who adopted my Giants fandom from afar, I’ve only ever come to the city specifically to see games in the beautiful ballpark on the bay. But this time, I was here for work and the only night of my trip that the Giants were home I was scheduled to shoot until well into the evening. The second problem was that I couldn’t shake jet lag. I’ve been falling asleep before 9 p.m. and waking up close to 5 a.m. day after day on a futon in my younger brother’s apartment. 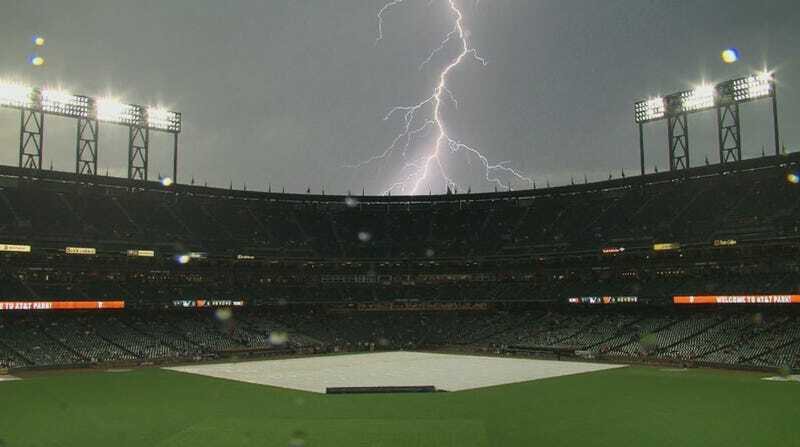 Because of the first problem and in spite of the second, when the Giants announced that they would be inexplicably resuming their game against the Dodgers—delayed by thunderstorms for nearly three hours, after a single pitch had been thrown—at 10:50 p.m. PDT, I had to go. The team is terrible and the decision to start a game so close to midnight made no sense but the weirdness was just too perfect to pass up. I begged my brother, a Berkeley grad student who is utterly apathetic about all sports, to at least drive me to the stadium. For whatever reason, he agreed and after changing out of pajamas, we left the house at 10:56 p.m. PDT. 11:23 p.m.: We arrive and try to obtain tickets from some of the people who are just leaving the stadium. At this point I am too focused on getting inside—we have already missed Denard Span’s first-inning home run into the Cove—to ask them why they waited out the rain delay only to leave once the game resumed. They tell us that while they’d be happy to help if they could, there’s no reentry at this point and the tickets are worthless. 11:33 p.m.: We successfully scalp tickets, overpaying at $30. I don’t have any idea where the seats were but the tickets get us in the gate and ushers are only turning people away from the most expensive field level sections. So we sit just behind home plate and it seems like everyone around us is wearing Dodger blue. 11:50 p.m.: The Dodgers tie up the game in the fourth while I visit with a beat writer friend just outside the press box. She’s been at the stadium for more than eight hours already. The garlic fries stand is closed. 12:01 a.m.: The PA system plays “Should I Stay Or Should I Go” while the video board warns that the BART system is shutting down for the night in just 20 minutes. A very pregnant Giants fan throws in the towel and leaves. 12:10 a.m.: Someone heckles Brandon Crawford nonsensically: “You still play for the Giants? I thought you got traded!” The trash talk will only get worse. And in an empty ballpark, you can hear all of it. 12:19 a.m.: There are at least some Giants fans remaining. Someone in the left field bleachers throws back Yasiel Puig’s home run. 12:29 a.m.: Hunter Pence beats out an infield single that lines lightly off the pitcher, prompting a pitching change. I don’t remember who was pitching before the change and I don’t remember who pitches after it, either. Nothing makes any sense and I’m no longer making memories. 12:39 a.m.: Buster Posey calls time. I hate him. 12:40 a.m.: Buster Posey hits an infield single to drive in a go-ahead run. He is my hero. It is still just the fifth inning. 12:45 a.m.: I chat with a couple fans. Jess, from Vancouver, has been here since 6:30. She’s come with a friend who doesn’t care about baseball. They’re celebrating her birthday, which was actually in June, and they have plans to be back at the stadium for a tour at 10:30 a.m. Jess, if you’re reading this, that tour isn’t worth your friendship. Jay is a local and like me, he pulled an audible after the rain delay and booked it to the ballpark. Some friends texted him at 11:45. about an extra seat that was too good to pass up. He says he sat right near to Giants CEO Larry Baer for a few innings there, before it got too late. We speculate that the disproportionate representation of Dodgers fans is a function of locals needing to go to work in the morning, while the visiting fans are on vacation. Jay tells me that there’s still beer down in the Field Club. But who needs booze when your body thinks it’s almost 4 in the morning? 12:57 a.m.: My brother is asleep and I have lost my ability to tweet without typos. 1:24 a.m.: “God Bless America” is sung in remembrance of Sept 11. It is Sept. 12. 1:30 a.m.: The only concession stand still open is something called Doggie Diner. A cashier tells me she’s been at the stadium since 3 p.m. I wish her good luck but I have no idea what that would look like at this point. 1:35 a.m.: I wave at McCovey Cove Dave, the lone kayaker still floating out there. He waves back. 1:40 a.m.: One usher jokes to another that they should get matchups ready on the out of town scoreboard for “tomorrow’s games.” It’s been tomorrow for a while, buddy. 1:44 a.m.: The paid attendance is announced at 40,409, I would estimate there are less than 1,000 people left in the stands. And most of them are only still here because they fell asleep a few innings ago. 2:00 a.m.: My husband texts me goodnight. He’s the night editor at the Associated Press back in New York, where it’s 5 a.m. He usually works until the last game is over. He’s handed this one off to the AP’s London bureau. It took me a dozen tries to spell bureau correctly just now. 2:10 a.m.: The game ends; the Giants win, 8-6; the security guards wish everyone a good morning on their way out. 4:22 a.m.: I finish writing this blog post. My body is still on East Coast time, and the sun is up there. It was all worth it to see the Dodgers drop their 11th game in a row.